A swim platform with ladder and good sized cockpit work well for family days in summer. Ground tackle set-up is user-friendly and the flybridge helm offers good visibility and necessary information. The cockpit will please anglers and socialites. The American built Glacier Bay 3080 is the first outboard powered long-range 30ft vessel I have reviewed. Despite having seen big outboard powered boats in American brochures and noticed the occasional large, speed-orientated vessel on Sydney Harbour, the outboard powered variety of long distance cruiser seems to be rare. I can only wonder why. The Glacier Bay 3080 proves the combo really works! The Webbe Marine package that Modern Boating tested was powered with the latest V6 SOHC four-stroke 3.5L fuel-injected Honda 225hp outboards. It combined well with the semi-displacement hull—which is a fine example of top shelf build quality. The 3080’s hull features surface piercing power rails and ‘super chines’ designed to soften the ride. Asymmetrical strakes help reduce the tendency to roll—as well as producing added stability at anchor and trolling speeds. The comfortable well-equipped helm featured lots of gauges, drink holders and twin screens for the GPS and sounder. I noted that the craft had freshwater windscreen washers—essential for maintaining good visibility in rough conditions. The hydraulic steering was light and the SST wheel featured a knob for quick turning. 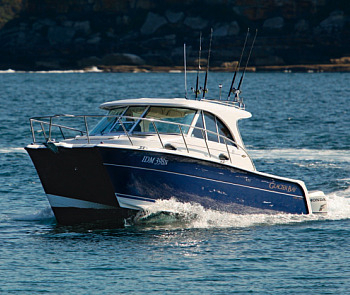 I was lucky enough to take the 3080 on a short offshore run from Sydney Heads, where she settled down to a comfortable cruise speed that would get you to distant fishing spots in good time. The 3080 wound out to 28.5 knots at 5800rpm but I got the feeling that the 4000rpm, 20-knot cruise speed would be a popular and efficient throttle position for the non-planing hulls over longer distances. Glacier Bay cats are manufactured in the US West Coast state of Washington, close to the Canadian border where conditions can be chilly. They date back to the mid ’80s, when Larry Graf set out to build a cat that achieved high speeds without a planing hull. The first full-scale 22ft, 2200lb (6.7m, 998kg) prototype delivered a 19.1 knots top speed with 60hp outboard power. Since this prototype, things have expanded considerably—there are now more than 2500 Glacier Bay Cats on the water—and the company now offers 11 model variations between 22-32ft (6.7-9.8m). To give you an example of the seaworthiness of these vessels, the 26ft (7.9m) Coastal Runner completed two tough Alaskan adventures: a 4345km run up the Pacific Coast to Prince William Sound and then across the Gulf of Alaska to Homer. A second adventure trip ran from Nome across the Bering Strait to Russia-Siberia and back. Webbe Marine’s Gavan Daly gave me the initial run-through on the 3080. Glacier Bay’s meticulous attention to detail was immediately evident—right down to the electrical control panel that featured printed wiring for each service in an immaculate covered panel. A fibreglass hardtop, an L-lounge with table, swim step and ladder, waste and water tank gauges, shore power system and windlass are all fitted standard in the Webbe Marine package. Test boat options included storm covers, hardtop hatches, a stainless steel rod rack and two 10.4 Furuno NavNet GPS/plotters/sounders (radar compatible). The 1kW transducer is glassed into the hull for seamless operation at high speeds. Safety features include a double-bottomed hull with foam filled collision compartments and four watertight compartments each with auto pumps. The large, open, aft cockpit is a good hint this boat has been built for fishing, a feeling reinforced by the long rod rack (holds 6 rods), padded inner combings, two insulated in-deck fish wells, saltwater deck wash-down, rocket launchers and a 140L bait tank. Below decks, the 3080 features a well-equipped galley with Corian counter tops, sink, stove, fridge and microwave. There is a forward ‘king-size’ berth and a separate head with shower (hot and cold). These areas are well finished and accessed via port side steps across from the helm. The vessel layout focuses on outdoors with an upmarket wet bar servicing the curvaceous settee with timber table. The helm seat folds forward to reveal a cooktop that converts the wet bar into a complete indoor/outdoor galley. We all like wide walkways, but do we need them on both sides? Cleverly designed asymmetrical walkways boost interior space. The port side walkway is about 10cm wider and offers excellent access to the bow, which has an appealing double seat with grab handles. You have to spend time on a vessel like this to appreciate its build qualities. It is a premium product, and priced accordingly, but dig a bit deeper and it becomes clear that what you are paying for is endurance. This craft will endure the test of time and I dare say hold it’s value—if you could bear to part with it. It was very rewarding to get out on a boat that was a little bit different. The 3080’s non planing hulls delivered excellent ride and stability. The twin outboards blend seamlessly with her crisp lines, and the smart blue topsides give her the looks to make her stand out from the crowd. Glacier Bay’s semi-displacement hulls are a remarkable example of build quality. The grid structure in each hull includes 7-10 full width bulkheads ranging in height from 178mm to 609mm and combines with a multitude of ribs and stringers for extra strength. All Glacier Bay stems are reinforced with Kevlar and 6-10 layers of premium E-glass 24oz woven roving. The Kevlar runs the full length of the stem and wraps around to the keel. Foam filled, watertight compartments throughout the hull offer added security at sea. In most areas the hull is laminated with 15.9mm to 22.2mm of solid fibreglass, and backed up with 127mm to 203mm of cross linked urethane foam and then reinforced with the hull’s inner lining. Our test Glacier Bay 3080 Coastal Runner was powered by twin V6 SOHC four-stroke 3.5L fuel-injected Honda 225s.